While being the biggest democracy of the world, when we talk about the politics of dynasty, we sometimes end up putting a blot on our democracy itself, the former union minister said. BHOPAL: "If an engineer's son can become engineer, a doctor's son a doctor, an industrialist's son an industrialist and a journalist's son a journalist, why can't a politician's son aspire becoming a politician," said Jyotiraditya Scindia, the former union minister and four-time Lok Sabha member from Madhya Pradesh on Saturday. Addressing a 'Meet the Press' program in Bhopal, Scindia when questioned about till when the blot of politics of dynasty continue to plague the Congress, said "I've been listening to these questions for the last 16 years. If like my father, I care for my people and am ready to serve them like him, what's wrong in it," questioned Scindia. "While being the biggest democracy of the world, when we talk about the politics of dynasty, we sometimes end up putting a blot on our democracy itself. Has the son and daughter of a politician not have right to serve his people. We're not forced upon the people from above, but have won the election every five years with popular public support." "I'm proud to be my father's son and my grandmother's grandson," said Scindia, the son of former union minister Late Madhavrao Scindia and grandson of Vijaya Raje Scindia, who was one of the founder members of the ruling BJP. While maintaining that he was against the system of giving extension of term to retired bureaucrats, particularly when it's done in an election year by the governments, Scindia said "I personally believe that even the CMs in states should have fixed terms. A man who has spent five years in office as CM should make way for someone else after the completion of his term," said Scindia. Importantly, the present CM of MP Shivraj Singh Chouhan has been in power since 13 years, while the last Congress CM of the state Digvijaya Singh too had won two successive terms between 1993 and 2003 in the same state. Scindia was responding to queries pertaining to the Shivraj Singh Chouhan government recently giving six months extension to the present chief secretary BP Singh. The present head of the State Congress Election Management Committee, who a few weeks back had batted for alliance with like-minded parties in MP, said "before deciding on seat sharing with any party, the two parties should have agreement of soul, ideology and principles. It cannot be a marriage of convenience, but has to be a unity of soul and principles, before proceeding on talks about seat sharing arrangement." His statement assumed significance, as other opposition parties, like the BSP and the SP, who have presence in parts of MP adjoining UP, have signaled that they might go alone against the ruling BJP in poll-bound MP. 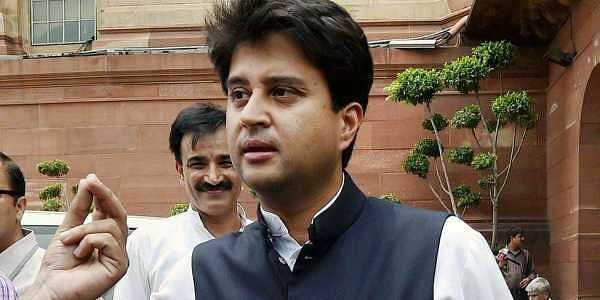 Scindia, who in the past had advocated for declaration of CM's face by the Congress in the state, changed his stance on Saturday saying "I personally feel that there is no need to declare CM or deputy CM's face in the state, but instead focus of preparing us unitedly for the battle against the BJP on the Ground Zero."